Protect little ears with the Snug Kids Earmuffs / Hearing Protectors. These comfortable earmuffs are fully adjustable to fit little ones comfortably while still fitting snug over the ears for superior protection against loud noises and sound that can cause hearing damage. Snug earmuffs are designed to work in a variety of settings. From sporting events to concerts to noisy shopping centers and airports, your child's ears stay shielded, safe and protected. They're powerful enough to block out the loudest of noises, from gardening equipment to power tools. If it's not comfy, kids won't wear it. That's why our Snug earmuffs are made for comfort and ease of use. Both ear cushions have plush padding to sit comfortably against the ears. Their lightweight and low profile design means kids won't even remember they're wearing them, even while enjoying their favorite activities. Plus, they'll grow right along with your child thanks to a fully adjustable design. They fit children as young as infants all the way through adulthood. Young toddlers, or children with auditory processing issues or autism now have a stylish way to block outside noises to prevent overstimulation. These earmuffs will help lessen noises from crowds while out shopping, mom's vacuum cleaner or rambunctious siblings playing in the next room. They offer your child a quiet "time out" to regroup, reducing behavior issues and undo stress. The foldable design is easy to transport in your purse or child's backpack. 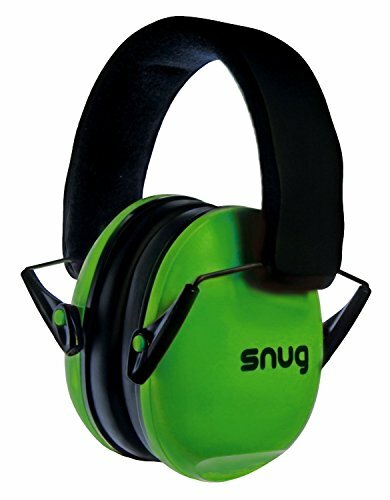 The Snug earmuffs are made from quality materials for maximum durability. In fact, they come with a five year warranty, so you can rest easy. Low profile clam design keeps the muffs safe and secure on little ears and offers a stylish look. Strong high quality parts make them sturdy and robust, so much so we give them a 5 YEAR GUARANTEE!